Everyone faces temptation. The question is, how do we deal with it? Judging from our results, most of us would have to admit that we need to learn more. There's a right way and there's a wrong way to respond when tempted; there is even a way to avoid temptation. Listen to this series and learn how. There's an old saying, "fail to prepare and you're preparing to fail." That is certainly true when it comes to temptation. In this message, you will learn what Jesus did to prepare for His encounter with Satan. What He did works, and it works every time. You better know the answer to that question if you expect to be victorious when it comes to temptation. Every temptation of life, at its core, is screaming the same question: "Who are you, really?" Answer this question correctly and Satan becomes powerless. 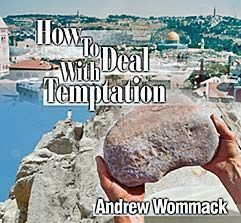 Andrew's clear teaching on this subject will help set you free. Satan's options are limited. And when you learn just how limited, your response to him will be, "Is that all you've got?" He only has three methods of temptation, and all three are rooted in our own selfishness. When you recognize his method, your response becomes obvious. The Bible says that Jesus was the Word, that everything He said is the Word, and that all power and authority has been given to Him. So, why then did He quote the Old Testament when Satan tempted Him? For the same reason we should. Listen as Andrew teaches with clarity about the power in God's Word. In this message, you'll learn how to avoid temptation. If you can avoid it, you won't have to deal with it. However, what that really means is taking personal responsibility and adopting a "no-excuse" approach. This isn't a message you'll want to hear if you're in the habit of making excuses.